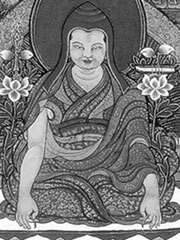 Dolpopa Sherab Gyeltsen or Dolpopa (1292-1361), the Tibetan Buddhist master known as «The Buddha from Dolpo,» was the founder of the Jonangpa sect of Tibetan Buddhism. Dolpopa was one of the most influential and original Tibetan teachers. Originally a monk of the Sakya order, he developed a teaching known as Shentong or Zhentong, which is closely tied to the Indian Yogacara school. He is considered to be one of the greatest exponents of the Kalacakra or «Wheel of Time.» His teachings were considered to originate in the legendary land of Shambhala. His controversial definition of the Buddhist concept of śūnyatā (usually translated as «emptiness» or «nothingness») as being two-fold, including «emptiness of self-nature» applying only to relative truth, while absolute truth was characterised by «emptiness of other,» was later heavily suppressed by the dominant Gelukpa order founded by Tsongkhapa (1357-1419).